Heaven’s Hope is a new point-and-click adventure that I hadn’t heard of before reaching out for a review code. 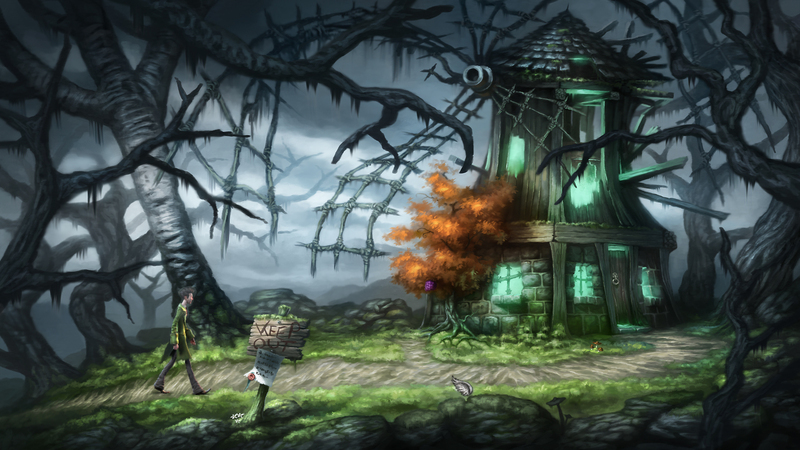 It’s German developer Mosaic Mask Studio’s first game. They’re also working on an upcoming mobile game called Dukes of War, a hex-based strategy game. The publisher, EuroVideo Median, also published Victor Vran, Fire, and Giana Sisters: Dream Runners. At the beginning of the game, you see a cutscene that shows the mysterious circumstances leading up to Talorel’s fall, which sets everything up quite nicely. The plot is definitely unique, especially for an adventure game. Talorel has help from two angelic friends along the way, Azael and Salome. Salome is more kind and Azael is more blunt, but they’ll both help you out a lot, both in-game and if you elect to ask for hints. The rest of the plot unfolds in a strange combination of whimsical and creepy, and I really enjoyed this world and the people in it. The end hints at a sequel, and I really hope that Mosaic Mask is able to continue the adventures of Talorel and the friends he meets along the way! 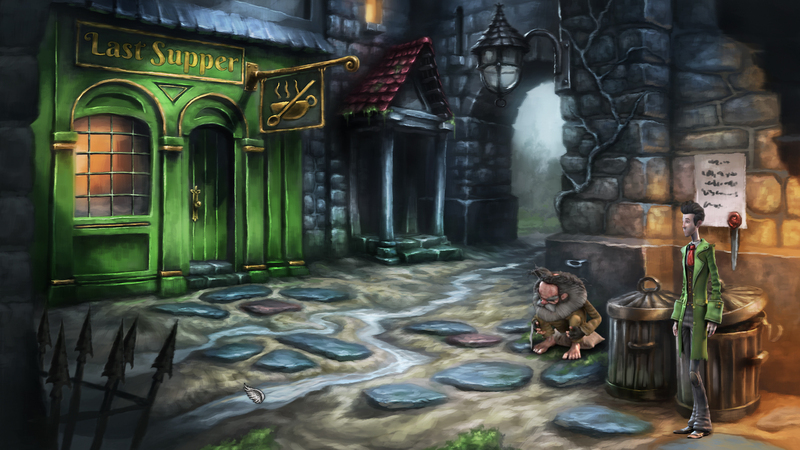 The backgrounds of this game are gorgeous – everything is hand-painted. 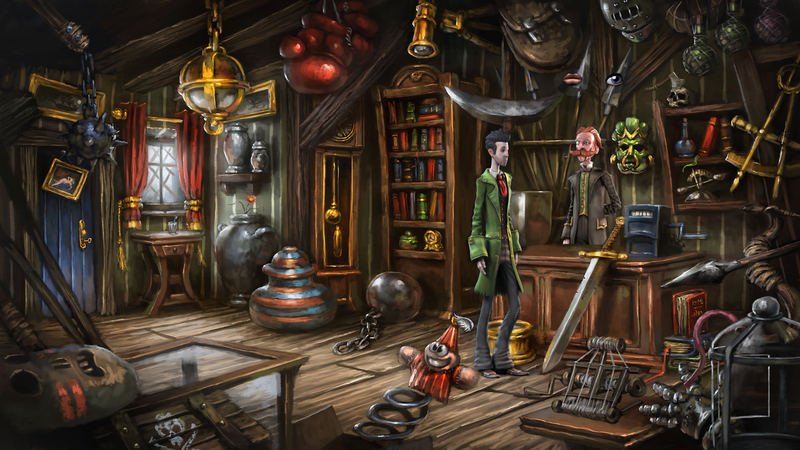 The characters are rendered in 3D, which makes them stand out from the backgrounds. Some of them blend in better than others. The mouths of the characters don’t sync up with their dialogue, but I stopped noticing that after the first scene. Your angel friends get special close-up portraits when they talk to you, which is a nice way of incorporating them. There is some odd artifacting during scenes that zoom in on a smaller character, which makes everything look not so great, but these don’t happen often. With the Special Edition (really the only edition available), you also get a digital artbook with commentary from the Art Director, Helge C. Balzer. This is available in both German and English. Before the game starts, you’re prompted to choose between spoken German or English. You can also play with German VO/English subs and vis-versa. The soundtrack was composed by Jonathan van den Wijngaarden; the music is subtle, for the most part, and fits really well with the game and setting. I played with English VO, and everyone does a great job. There are a few typos and cutoffs in the English subtitles, and one instance where the voiced line didn’t match with the subtitle, but overall this was an excellently-translated game. Often when I’m playing a translated game, I can tell that it’s been translated because of language quirks, but I didn’t notice anything that threw me off here. This is a one-button game, for the most part. Every interactable object, when hovered over, will have icons appear above it that show what you can do with it (pick up, talk, use, and a few surprises). You can double-click on the screen to jump to a different place without watching the walk animation, and also double-click between screens to transport yourself there instantly. There’s a fast-travel map too! Right-clicking will skip to the next line of dialogue. The space bar will show you all the interactable objects on screen (yay for no pixel hunting!). You can get hints in two places – there’s a hint button on the top right of the screen, and once you have access to your journal, you can get specific hints by investigating what’s written there. A few mini-games are incorporated into the game, including what is basically a sliding brick puzzle, but thankfully the game will note if you’re having trouble and one of your angel friends will ask you if you want to speed things along. This feature is awesome and I think it will save a lot of player frustration – it certainly did for me! The puzzles are very clever overall, and some of them made me grin. Two of my favorites were shuffling urns around a graveyard so that the owners were happier, and making a toupee out of tarantula fur. Seriously. There are 26 Steam achievements, and I ended up with all but one of them at the end (that one involves a choice). It took me a little over five hours to complete (looking at a walkthrough a few times, but solving almost everything on my own). 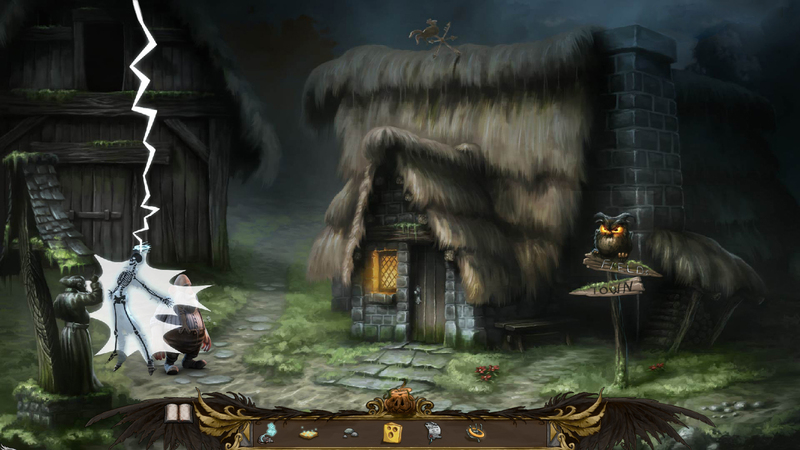 A delightful adventure game with likeable characters, beautiful art, and some really clever puzzles. Excellent for everyone, and I wholeheartedly recommend it if you’re looking for a new adventure game. I had a lot of fun with this one, and finished it in one long sitting. I can’t wait to see what the team does next in this world! You can get the game on Steam for $19.99. Follow the team on the official website, Facebook, Twitter, and YouTube.